For today’s Bob’s Spotlight, we’re focusing our attention on the prestigious Rolex President Day-Date 118238 with a diamond dial. Join us as we review Rolex’s signature dress watch and discover why it’s the ultimate status symbol. The Day-Date 118238 is a watch with a few distinct features. The Rolex President ref. 118238 is Rolex’s current Day-Date 36 model. Making its debut in 2000, it replaced the preceding Day-Date ref. 18238. With its introduction, the then-new ref. 118238 brought a few enhancements. Although on paper the President ref. 118238 sports the same 36mm Oyster case, the newest Day-Date actually wears larger than older models due to broader lugs and a slightly wider construction. 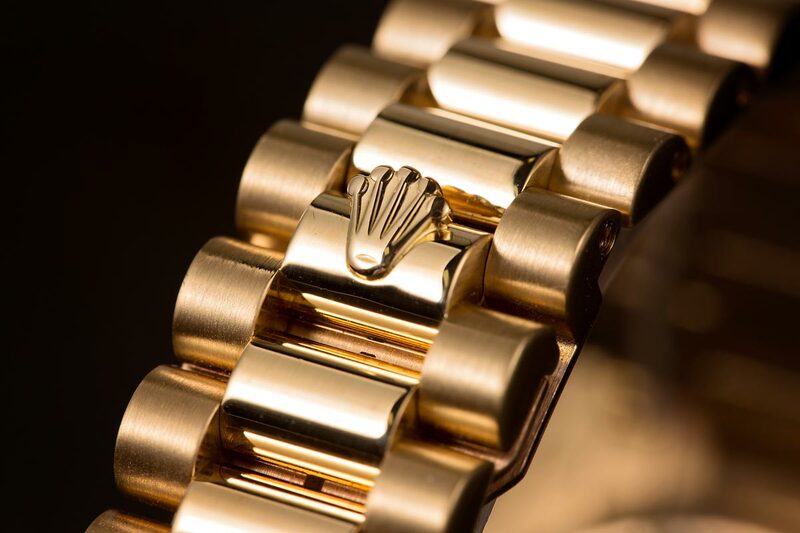 The details that Rolex puts into the watch are exceptional in quality. 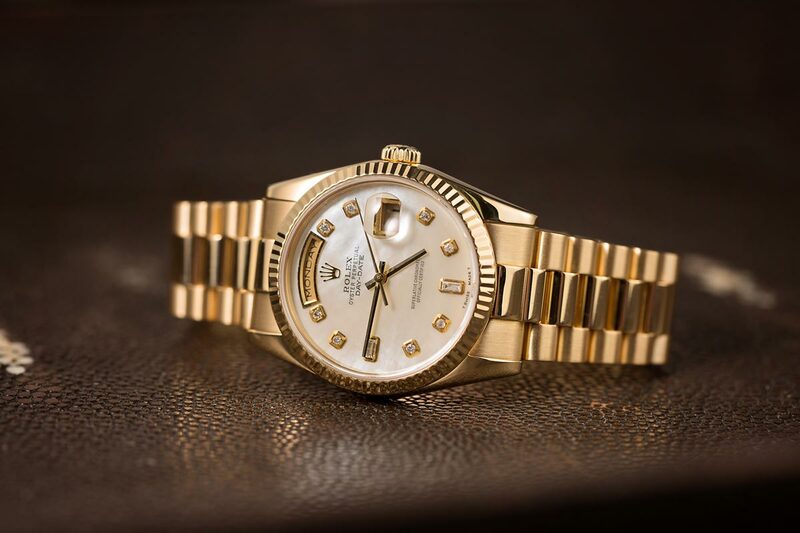 The Rolex Day-Date 36 ref. 118238 is also heavier on the wrist thanks to its enhanced President bracelet built with more gold. Additionally, the current Rolex Presidential has an improved concealed folding Crownclasp for better security and comfort. Similar to the previous Day-Date 36, the Presidential ref. 118238 comes equipped with a Twinlock screw-down winding crown, screw-down caseback, and sapphire crystal. Subsequently, the President is water resistant to 330 feet (100 meters). While the Day-Date 36 ref. 118238 keeps the Caliber 3155 of earlier versions, those produced in 2015 and after boast the new Rolex accuracy rating of -2/+2 seconds per day and a five-year guarantee. The in-house Rolex Caliber 3155 drives the center hour, minute, and seconds hands, as well as, the instantaneous date and day windows. The current Day-Date ref. 118238 also has the double quickset feature and hack function. Overall, the Day-Date 118238 is a classy watch. There are ten diamond indexes — a pair of baguette-cut gems at 6 and 9 o’clock along with the remaining brilliant-cut ones. To complement the precious metal of the case and bracelet, the diamond hour markers and calendar apertures are surrounded in 18k yellow gold too. 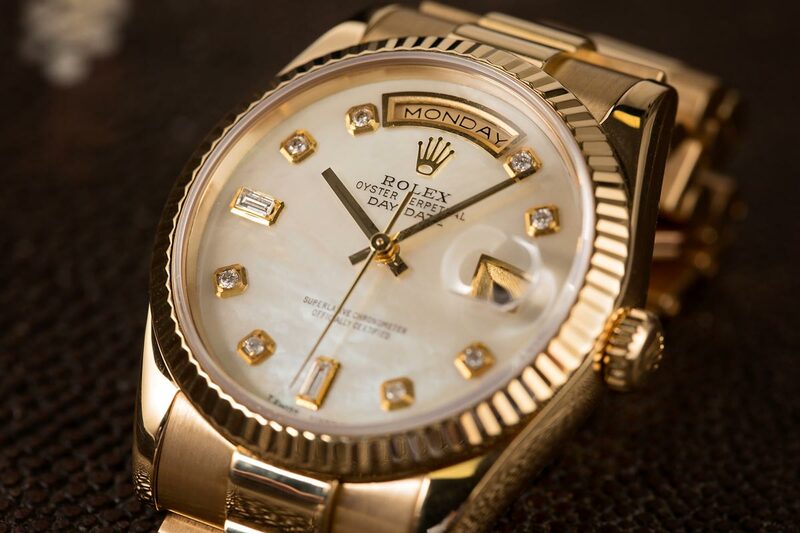 Topping the gold case is a fluted bezel, which is an iconic Rolex design touch. 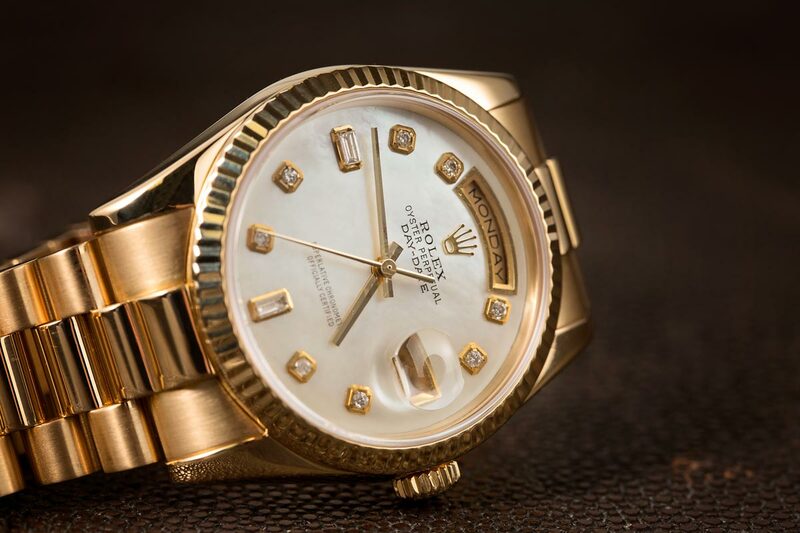 Exclusively crafted in either gold or platinum, the Presidential is one of the most expensive Rolex watches available. As a result, the Day-Date has always been a symbol of success. In fact, it even picked up the now ubiquitous “President” nickname in part because it was the watch worn by presidents, global leaders, and captains of industry. Today, the Rolex President is a favorite among celebrities too and the 36mm size of the Day-Date ref. 118238 makes it the perfect luxury watch for both men and women. We’ve spotted Jennifer Aniston, Victoria Beckham, Reese Witherspoon, and Rihanna rock a yellow gold 36mm Rolex President. Plus, Justin Theroux, Adam Levine, and Eddie Murphy are also fans of the elegant 36mm yellow gold Rolex Day-Date President. The Day-Date 118238 is littered with luxury as seen with the diamonds and the Mother of Pearl dial. Since its inception in 1955, no watch comes close to making a grand statement like the Rolex President. And the current version, the Day-Date 36 ref. 118238, is a contemporary approach to the quintessential classic luxury dress watch.